Joni: Each of my mom’s used your sperm. Paul: As in two? As in both of them? Joni: Uh-huh, as in gay. I don’t know if anyone has told you this already but family can be fairly complicated. Take Nic and Jules (Annette Bening and Julianne Moore) for example. They’ve been together for about 20 years and have two teenage children, one of which (Mia Wasikowska) is about to head off to college. The other (Josh Hutcherson) is somewhat aimless in his adolescent life and decides he needs to know more about where he came from. More specifically, he wants to meet the man who supplied the sperm that made both him and his sister possible. Enter Mark Ruffalo and along with him a disaster of familial proportion. THE KIDS ARE ALL RIGHT is the fourth film by Lisa Cholodenko, who has regularly explored the nature of complicated relationships and what happens to them when those involved make mistakes they know could crumble their foundations. Deciding to meet sperm donor, Paul (Ruffalo), is not that mistake. His introduction into this family’s life though certainly seems to have given all its members free reign to act out. Naturally, his emergence puts Nic and Jules into a tailspin and how they each approach the situation exposes some of the couple’s deeper issues. Bening and Moore play the couple so perfectly, you can feel a palpable sense of unbalance in the way they treat each other and an urgency to survive. It’s as though years of experiences, both great and harrowing, have been worked into their collective performances. While Nic and Jules struggle with feelings of inadequacy and replacement, their kids, Joni and Laser (Wasikowska and Hutcherson) try hard to see themselves in Paul. When all three sit to talk for the first time, it is apparent that both nature and nurture played a part in the two kids’ growth. The delicate nature of the introduction is almost lost on the kids because they simply don’t know better. They don’t know that you can go from relating to feeling completely alien in a matter of seconds and that when that happens with the father you never met, the damage can be severe. In their innocence, they thought they wanted something but could never have truly prepared for what they got. And the same can be said for Paul. The potential of family woos him into thinking his life is empty and it isn’t long before he tries any way he can to latch on. 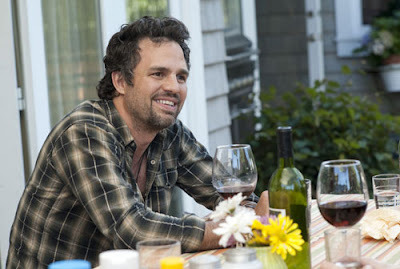 Ruffalo is the consummate boy pretending he can be a real man. Cholodenko has learned to breathe in the six years since her last feature. 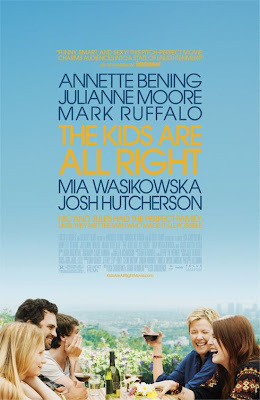 THE KIDS ARE ALL RIGHT is like a breeze with a bit of a bite on the back end. As awkward and troubling as all these interactions are, they pass by smoothly and make for a refreshing film – one where a fantastic cast portray real people with equally real problems that deal with them like a good family should, with sensitivity, solidarity and a little humour to keep the mood light. Yes, the kids are all right but the movie is even better. i’m relaly anxious to see thsi fmovie. thanks for your review.